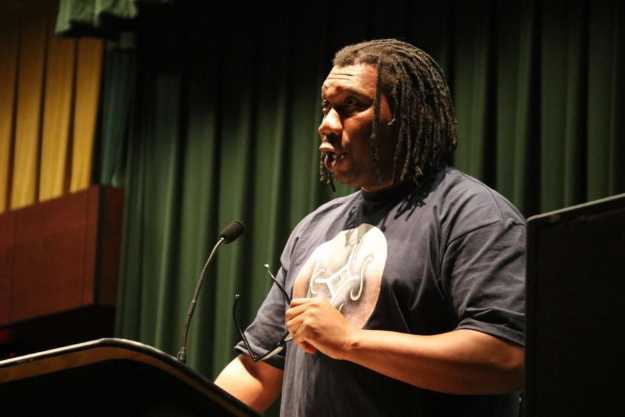 KRS-One held a lecture to discuss race, African-American history, colonialism and the public school system. Hip-hop artist KRS-One held a lecture in the Redwood Room of The University Union on Feb. 8, discussing his thoughts on race, colonialism and the public education system. “According to European history, black history never existed,” KRS-One began. Confused expressions from the audience were met with further explanation from the lecturer. KRS-One went on to explain that black history predates American history, and that presentations of black history in U.S. schools often begin with slavery. KRS-One said that people can learn about their past a lot more easily now than the past due to technology, which can be advantageous for youth seeking to discover their roots. He discussed that he believes classes often focus on individual historical figures rather than the larger story of how social and other forces interact to produce sets of circumstances. The example KRS-One used was the underground railroad. Harriet Tubman would have saved more slaves if they better realized how much they were the victims of systemic oppression. Following the lecture, Sac State student DeWayne Lamont — who said that KRS-One was a heavy influence on his work as a rapper (he goes by the name Consci8us) — asked KRS-One a question about the modern state of hip-hop. The two held an impromptu freestyle session in the Redwood Room as a crowd surrounded them. Another topic KRS-One discussed was relations between the sexes, saying that the differences between genders are important and that women should be esteemed more highly than men. Cara Lamumba, who attended the event, agreed with him. The last message that KRS-One gave his audience was that racism shouldn’t exist. We have to know about history to understand other cultures, he said.